The Grace King Sham is a fun and eccentric combination of variously sized patterns and patches, styled the way VHC customers have loved for many years. 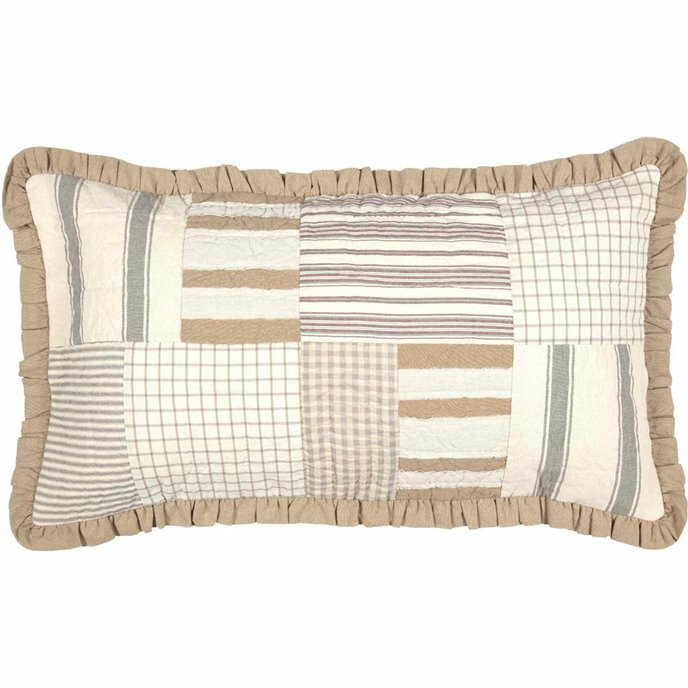 Elegant enlarged ticking stripes - a farmhouse staple - are spaced among checks and windowpanes and encompassed with a ruffled burlap border, giving the sham a breath of visual fresh air. Hand-quilted, 100% cotton. Features Stitch in the ditch and echo hand-quilting on various neutral creme, mauve, and grey plaid, solid, and striped fabrics. Irregular block layout accented with random squares of frayed creme cotton flax strips appliqued on natural-colored chambray. Trimmed with 1.5" natural-colored chambray gathered ruffle. Reverses to creme, taupe, and mauve windowpane plaid cotton fabric. Features 3 tie closures with 3" overlap to conceal pillow insert. Hand-quilted, Machine pieced patchwork. SPECIFICATIONS: Dimensions: H21"xW37". Weight: .9 lb. Material: 100% cotton shell, 100% cotton batting. Colors: creme, natural, nickel grey. Item is imported. CARE: Machine wash in cold water with like colors, gentle cycle. No chlorine bleach. Tumble dry low, remove promptly. Iron if needed. The manufacturer's UPC code for this item is 840528165702 and it is part of the Grace ensemble by April & Olive manufactured by VHC Brands.